On Sunday mid-mornings when I was growing up, my brothers and I were not allowed to watch television after returning home from morning mass. Mom simply did not want us to get all caught up in a program or movie that could possible prevent us from sitting down to the table when she called us for dinner around noontime or shortly thereafter. As an Italian-American family, dinner was always served midday on Sundays and it was always pasta. Needless to say, after growing up eating pasta twice a week (Mom also served it every Thursday), plus eating the same weekday dishes week in and week out (beef stew on Mondays, stuffed chicken on Tuesdays, homemade pizza on Fridays, etc. ), all I wanted when I moved out was a variety to my dinners with little repetition and no white carb pasta ever again. Now that I eat Paleo, I love exploring new recipes and finding ones that replicate the not so nutritious meals I once ate. Often my dinner guests will say to me, “This is Paleo?” I think they anticipate a plate of blandness with no pizazz. That is far from reality! Below are just a few of my favorite Paleo dinner dishes. I hope you enjoy them as much as my family and friends. A twist on Chicken Parmesan! Make the bruschetta ahead by combining 3 chopped large heirloom or garden grown tomatoes, about 15 chopped basil leave strips and 2 to 3 peeled garlic cloves into a bowl. Drizzle with 3 tablespoons extra-virgin olive oil and 1 tablespoon balsamic vinegar and sprinkle with sea salt to taste. Gently mix together just to combine flavors. Let set a couple hours for flavors to mix. For the chicken, mix together the juice and zest from one lemon, 1 garlic clove crushed, 3 tablespoons fresh basil finely chopped, 1 walnut oil, and sea salt and pepper to taste. Marinade 4 chicken breasts in the ingredients for 30 minutes to 24 hours then grill until cooked through and no longer pink in the middle. Lastly for the zucchini noodles, slice 4 medium to large zucchinis thinly. Melt 1 teaspoon coconut oil in a pan and sauté zucchini until warmed throughout but al dente, approximately 2 minutes. Season with garlic salt and drizzle with olive oil. To arrange, place a small amount of noodles on a plate, then top with the chicken and bruschetta. A healthy makeover to spaghetti with meat sauce! Preheat oven to 375° F. Cut 1 small or medium spaghetti squash in half length-wise with a large knife or cleaver. Place cut side down in a shallow baking dish. Add 3/4″ of water to the dish. Bake for 45 minutes, until the squash is soft to the touch. After 30 minutes of baking, heat a large sauté pan over medium-high heat with 2 tablespoons coconut oil. Add 1 pound ground lamb (elk or bison), 1/8 pound ground liver (optional), 1/2 diced yellow onion, 1/2 teaspoon sea salt (optional), 1/2 teaspoon granulated garlic, and 1/4 teaspoon oregano and cook 5 minutes. Stir frequently. Add 8 medium white button or cremini mushrooms sliced and continue to cook until lamb is fully done, 10 to 12 minutes. Set aside. When squash is done cooking, remove it from the oven and cool until it can be comfortably handled. Turn the cut side up, and remove from the rind with a fork. This should be done cross-wise, so the strands of squash fall out like spaghetti. Spoon lamb mixture over spaghetti squash to serve. Top with either a Paleo Pesto or Mojo Verde sauce. Place 1 bunch cilantro, 1/4 to 1/2 cup olive oil, 1 to 2 cloves garlic and 1/2 teaspoon sea salt into a food processor. Blend until desired consistency is reached. Makes approximately 1 cup. Place 2 oz. fresh basil leaves (about 1 cup packed full), 1/4 cup raw pumpkin seeds, 1/4 cup raw cashews, 2 tablespoons lemon juice, 1/2 teaspoon coconut aminos, 2 cloves garlic, 1/2 teaspoon sea salt (optional), dash cayenne pepper, and 1/2 cup olive oil into a food processor. Blend into a smooth paste. Stop and scrape the sides of the bowl down to get an even texture several times during blending. Add more or less olive oil to reach desired consistency. Makes about 1-1/2 cups. Double or triple the recipe and freeze leftovers for future meals. This is a neighborhood cookout favorite! Prepare grill or turn broiler on high. Mix 1 tablespoon olive oil and 1 teaspoon chipotle powder together in a small dish. Brush onto both sides of 1 pound beef flank steak. Grill approximately 5 minutes on one side and 3 more minutes on the other. Or broil 3 minutes on one side, and 2 minutes on the other. Remove to a plate. Cover and let rest for 10 minutes. Grill 4 slices fresh pineapple rings for 2 to 3 minutes per side (or broil for 45 seconds to 1 minute per side). Cut the pineapple into small chunks and place in a medium bowl. Add 1 diced large red bell pepper, 1/2 diced red onion, 1/4 cup chopped cilantro and juice of 1 lime. Mix together. Slice the steak thinly and top with pineapple salsa. This recipe is really easy and always a big hit with guests. 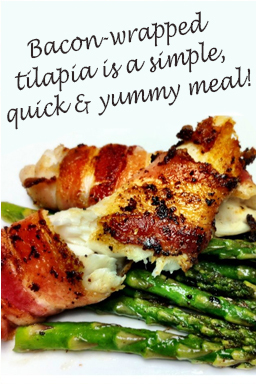 Wrap each piece of tilapia with one strip of bacon. Place fish in a medium-hot skillet and sauté a few minutes on each side or until bacon is crispy. When cooked, place fish on a plate with a paper towel to soak up any bacon grease and sprinkle with salt and pepper to taste.